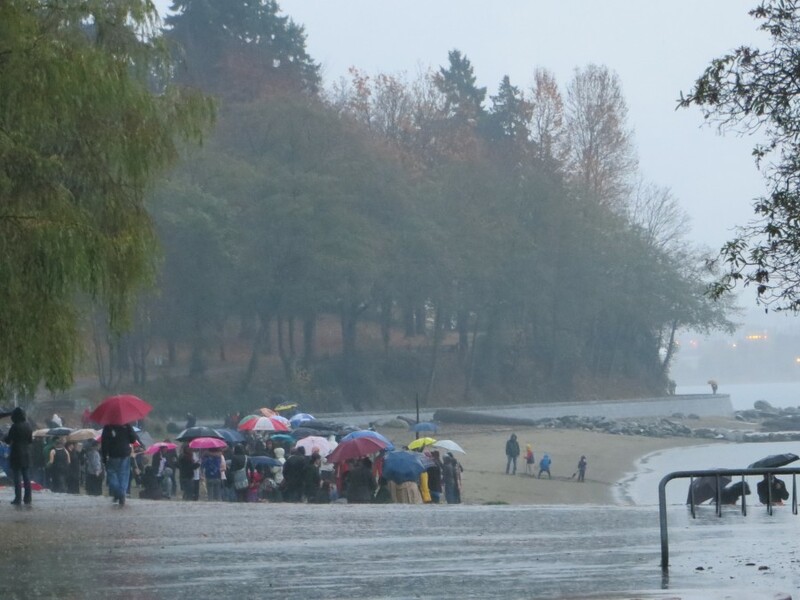 I am not even taking part in GISHWHES... and yet, I found myself today in the pouring rain in Stanley Park, soaking wet with glue in my hair. Let it not be said that I am not a good friend... at least on occasion. I'd say there were about 200 people there. We were confusing the locals... though, truth be told, the locals were confusing me, because who the hell goes running/biking/strolling through Stanley Park in such miserable weather! Misha arrived and was a bit flabbergasted at the sheer numbers. There were many people though, like me, who had come as support for their crazy friends. Misha looked quite nice, I must say. They divided us into teams of 20 and then told us to build popsicle stick towers. Point rewards would go to highest and most beautiful. We were to build them on the beach. One member of our team was in a wheelchair though and couldn't go into the sand. This suited me fine. I stayed up with her on the sidewalk, thinking that I had cleverly found an excuse not to get covered in sand. What I hadn't factored into my thought process was the fact that I was kneeling on pavement, in the rain...the only place the water had to go was into my jeans. Also, my leg muscles were not prepared to kneel for that long, they are stiffening as we speak and not in any sort of good way. It poured rain the entire 1.5 hours we had to complete the project. Did I mention that? 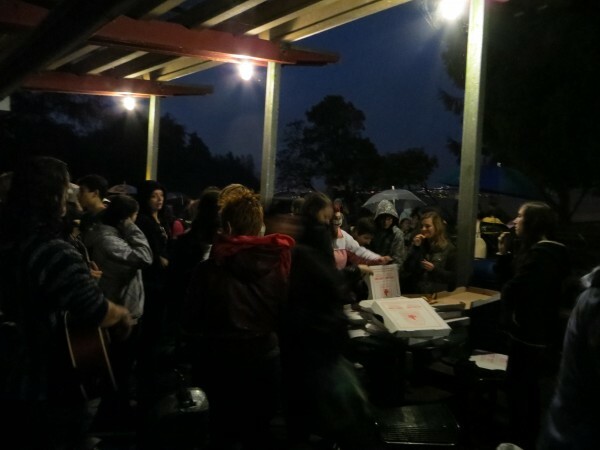 Basically, as soon as we started, a heavy rain cloud opened up above us and did not move on until Misha had called time. The problem with rain is that it makes glue somewhat ineffective. We realized that the team next to us had the right idea. Team "We Tried", they called themselves. They made a devil's trap in the sand with their popsicle sticks and then declared their contribution to the days events over - and off they ran to hide under the awning of the closed canteen, where Misha had ordered us all pizzas, though admitted that we would probably lose if we took the time to eat them. Misha had also brought along a musician to serenade us while we worked. He walked around for a bit, but then the rain really dumped and he hid under the awning too - serenading those who gave up and were waiting for the their cabs. 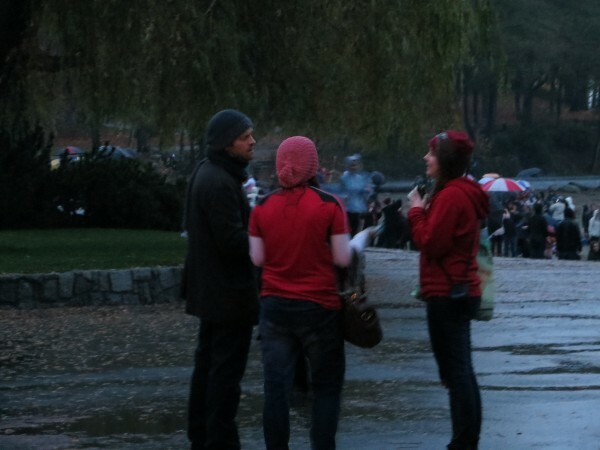 Misha walked around and talked a bit. He made sure that each group of 20 people got a picture with him. (He missed one - Team "We're the only ones who can get it up"...which is why in the video I have, he tells Team "Get it up" to meet him "in the men's room." lol) Like anything Misha does, everytime I passed him there were a small gaggle of fans following him around and talking to him. (I never stopped, as I have a very sensitive "this is awkward" meter that prevents me from doing such things.) I did overhear one teenage girl as if he had any acting tips - and I didn't hear his response, because I was already passed them and walking away, but from the tone of his voice, he seemed to be giving her a serious answer along the lines of "just keep at it." He ordered more pizza at the end, to make sure everyone got some. Here's a video I got of his concluding speech. Unfortunately, it's very very dark...so you can't really see anything. To give you a feel for what winter in Vancouver is like please keep in mind that this video was taken at around 5:30pm.